We all have dreams of rock stardom. However, most of us should never be heard by other sentient beings trying to belt out our early-morning version of “Total Eclipse of the Heart”. You can solve your rock star problems or drown out your lack of singing skills by waking up to the Retro iPod Alarm Clock. It’s a clock, it’s a dock and it will wake you up to your favorite tune – even if it’s something by 98 Degrees. What makes this iPod alarm clock unique is that once you plug in your iPod to the dock, the iPod switches to clock mode and will even charge up while you’re sleeping. The Retro iPod Alarm Clock also features onmi-directional speakers which can be adjusted with an old school analog dial control. 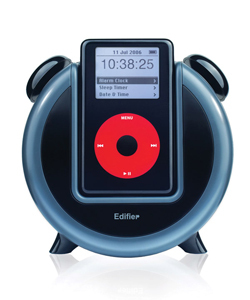 This alarm clock is compatible with all iPods except for the iPod Shuffle (no confirmation on whether or not the iPod Touch will work with this alarm clock). For those of you who don’t want black, you can also pick up the Retro iPod Alarm Clock in either White or Pink. This product will not improve your chances to become a rock star, however, but it will make sure you get to work on time. Pick one up over at the Gadgetshop for £39.95.